I spend a lot of time in Safari which is my browser of choice. I would like to share the resources I’ve come across to improve the Safari browsing experience. Even though I’ve talked about a couple of these in bits and pieces before I wanted to create a single comprehensive post that covers Safari across the board; tips, helpful sites and some usage techniques. Before we begin there are some settings that you should check. 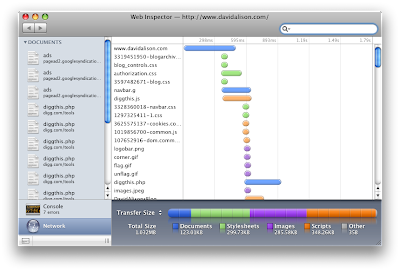 Open the preferences (Command-,) within Safari. In the General section I have my browser set to open links from applications in a new tab in the current window. Though I do occasionally use multiple Safari windows it’s pretty rare – I much prefer to keep it all in one window and leverage the tabs. Under the Tabs section I also have Command-Click open a link in a new tab and do not select tabs and windows as they are created. Once that’s done you must close down Safari and restart it in order for this to take effect. Another thing I always turn on is the Status Bar (Command-/). When I hover over most links it will show me where the link leads and I get an idea of what’s going on as pages load up their contents. If you are a technical user or developer you may want to turn on the Develop menu, located under the Advanced section. This will add a Develop pull down menu between Bookmarks and Window in the menu bar. It gives you some access to a couple of cool features I discuss below. Finally, I have have my middle mouse button set to open a link in a new tab in the current window, similar to Command-click. This is usually controlled by your Keyboard and Mouse settings under the system Preferences. Since I use a Logitech mouse and USB Overdrive I change the setting from that screen. I love tabs in browsers. It is far and away the best thing that’s been added to the browsing experience since web browsers were initially introduced. I rarely have multiple browser windows open, preferring instead to use as many tabs as I can. If I conduct a search or am on a link rich web page I will often just use the middle mouse button—or Command-Click—and open every link that looks interesting. They populate in the background while I continue reading what’s in front of me. Only after I’m done with the page I’m reading will I start to explore the subsequent tabs that were created. As with many people in the internet age I have developed a mild form of attention deficit disorder, popping from topic to topic without focusing on content. This model of using tabs has helped me become a bit more focused. *Yes, I know it’s not a Safari thing; works in any Cocoa application as well. I just use it most often in Safari. There are other shortcuts listed in Help but these are the ones I’ve found the most helpful. I use the Bookmark bar, which is just above the tab line, for my most common destinations. I always rename items after I’ve dragged them there to keep it as short and sweet as possible. I also create pull down folders on the Bookmark bar for each of the key areas I focus on: Technical resources, Mac Stuff, Family, Work and Development. In many cases I’ll add sub folders under these as well. For some reason I have not found much value in the Bookmarks menu bar. I think this is a function of having multiple monitors and sometimes my Safari window is on my second monitor while my menu bar is permanently fixed to my primary monitor. This way my browser list is always close at hand. If you turned on the Develop menu in the menu bar there are a couple of interesting things you can do. I mentioned before that you can fake some web sites into thinking you are running a different browser. But if you are a web developer or interested in what’s really happening behind the scenes of a web page you can access some powerful inspectors through the Develop menu. If you are building a web site or helping someone troubleshoot a problem area the Network Timeline is a great resource for figuring out where the bottlenecks are. There are really only two add-in resources for Safari that I’ve found really helpful. By far the most helpful is 1Password. You can read my original blog post about it but I will say again it’s a fantastic utility and I highly recommend it. In addition I also use Inquisitor, which adds some enhanced searching functionality, essentially making the Google search box perform much like the in-site searching features on Apple.com. I also have more on Inquisitor in a recent blog post. There is also a collection point on the web for Safari plugins called PimpMySafari.com. 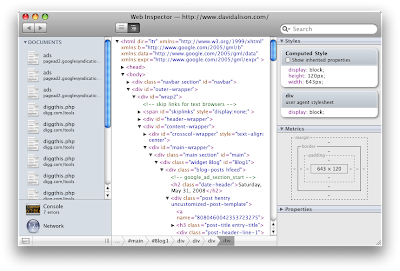 Inside of that site you will find a number of add-ons for Safari with nice little summaries and feature lists. While I covered all of the things I’ve learned about making the most out of Safari over the last four months I’m sure I missed something. If you have a specific tip that you think would help folks please add it in the comments below. I mentioned at the beginning that this would be a comprehensive list and I’m pretty confident that if I missed anything one of the many people that have been helping me will chime in and fill in the blanks. Im currently using Safari and many of friends are also using the same. So those who havn’t experienced it I will suggest them to check it out. Guys its awesome.